In a dystopian future not so far away, nuclear power plants have failed and people are fleeing radiation from reactor meltdowns. The nation’s power grid has gone dark. Groups of travelers are banding together for protection from marauders. Post-apocalyptic movies and television series are the rage today, but no one has explored post-apocalyptic entertainment – until “Mr. Burns,” that is. Anne Washburn’s three-act, pop-rap operetta opened June 3 at downtown Reno’s Brüka Theatre. Directed splendidly by Mary Bennett and Cami Thompson, the dark comedy imagines a regression of theater in a world with no electrical power. 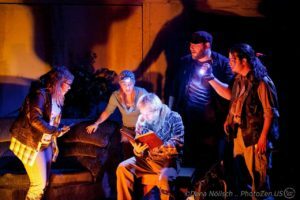 If you’re not a theater goer, you might do a double take and think, ‘so what?’ Well, it so happens that our modern culture is dominated by theater. But most theatrical performances are delivered electronically to our televisions. No electricity, no theater – cultural devastation. As “Mr. Burns” opens, a group of post-meltdown travelers gathers around a campfire discussing their favorite theatrical performance: The Simpson’s episode of “Cape Feare,” a spoof of the 1962 “Cape Fear” film and the 1991 remake. In this Simpson’s episode, nefarious Sideshow Bob is stalking Homer’s son, Bart. The play fast-forwards seven years and a similar group of travelers earn their living performing the Simpson’s episode, complete with musical commercials sung acapella. Washburn snuck in a commentary about the commercial value of content and the inaccuracy of oral history, as the post-apocalyptic theater troop negotiates with “memorists” for precise bits of the script. Fast forward another 75 years and “Cape Feare” has evolved into good-versus-evil religious narrative with Mr. Burns (Kiba Walker) as a bloodthirsty feline-esque creature in a gold lamé jacket accompanied by a kitty imp choral duo. Meow! And fictional Springfield has become a sort of Eden. The comedy operetta is a bit long for what it is, 2 hours 45 minutes. Playwright Washburn spent a lot of time setting the stage in the first act and the second act is a bit bloated as well. But the third act is one of the tightest, superbly stylized performances I’ve seen on a stage. Bravo! Thompson provided the musical direction and wrote excellent scores for the “stripper” and “vaudeville” scenes. The Post-Electric Band provided live accompaniment with vocals, electric piano, glockenspiel, baby glockenspiel, tubular bells and drums. “Mr. Burns” is far more than just toe-tapping entertainment. It’s also an exploration of the evolution and conflation of a fictional performance into a religio-historical narrative. If that sounds a bit deep, on one level it is. But it won’t stop anyone from delighting in this first-class musical production. Bennett, Thompson, choreographer La Ronda Etheridge, and a superb cast of actor-singers simply overwhelmed minor criticisms of the writing to deliver a mind bending evening of music and comedy with a provocative sub-theme that is pure enchantment. Do not miss this one. I give it a well-earned five “doh!” stars.